This post first appeared on Nature Valley. The best childhood memories are made in nature. When I think back to my own childhood, I remember lots of hot summer days playing in the field beside my house with the neighbourhood kids. I was always outside when the weather was nice. Fast forward 30 years and times have drastically changed. I’m a mom with two daughters of my own and sadly, they don’t spend as much time outdoors as I once did. I know they are missing out on lots of fun memories and I hope to change that. It’s never too late. Vision Critical conducted a survey for Nature Valley with some eye-opening results. 54% of Canadians feel they spend less time outdoors than their parents while 56% said they don’t get enough outdoor time. I believe it. In today’s digitally connected society, we are often stuck indoors attached to our screen and spending time outside in nature isn’t a priority. I’m guilty of it myself especially since I work from home on the computer. I know I need to get myself and my family outdoors because we are missing out. 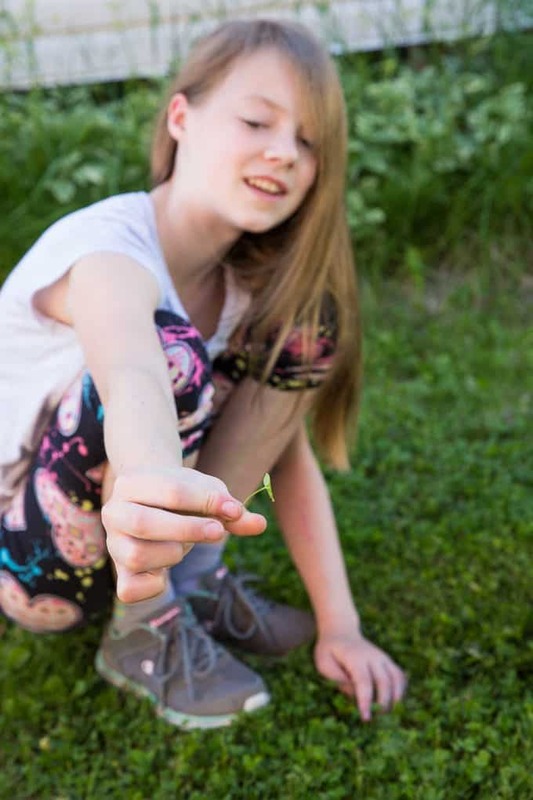 Nature Valley developed 100 #NatureMoments for 100 Days of Summer to help Canadian families connect with nature and most of all, have fun together. It’s easier than you think! Spending time in nature doesn’t mean you have to drive to find a provincial park or hiking trail. Nature is all around us. Just step outside your front door and explore your yard or a nearby park!According to the survey findings, 83% of Canadians live near a park so there is nothing stop us from getting outdoors and enjoying time together. We are lucky to have a large backyard with lots of trees for shade. Now that the nice weather is here, I’m making spending time outdoors a priority for our family. I was inspired by Nature Valley #NatureMoments list and wanted to share just how easy it is to add a little nature to your family’s daily routine. The first of our #NatureMoments was searching the yard for a four leaf clover. My daughter, Bridget, looked at me quizzically when I told her what we’re doing, but I asked her to trust me and that it would be fun. Hopefully by the end of the summer, experiencing these small #NatureMoments will become the norm for her. 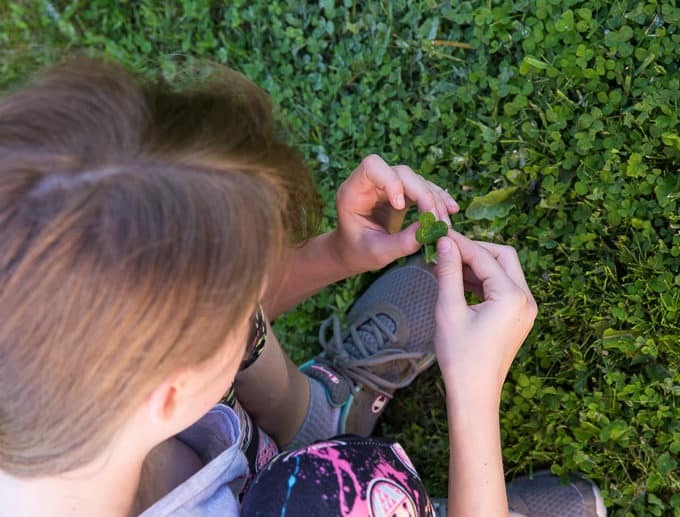 Turns out, we have lots of clover patches in our yard! Bridget was intently trying to find one especially after I told her the story about how I found a four leaf clover when I was a little girl. I remember the excitement and joy I felt for finding something so rare. My Grandma June always said that finding a four leaf clover meant you would be lucky in life. I hoped that Bridget would find one too so I could save it in her scrapbook like my mom did for me. She didn’t find a four leaf clover although she pretended she did a few times! 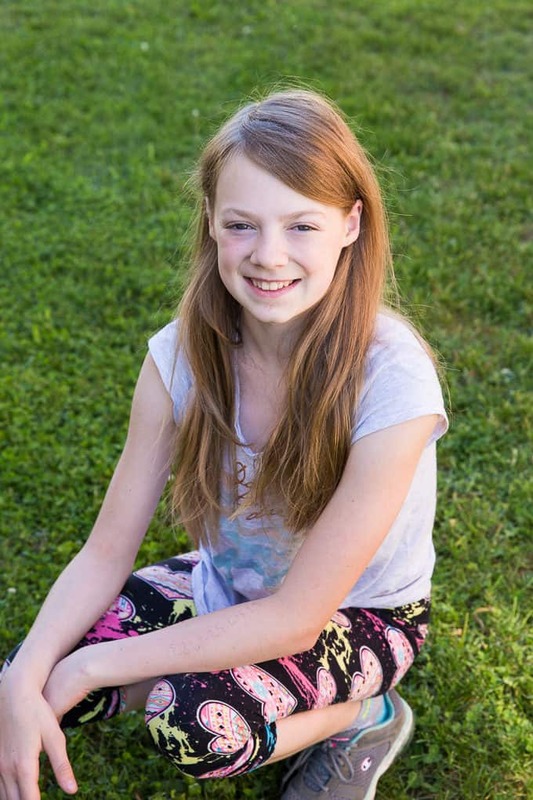 She is determined to find one this summer and plans to search in her grandparent’s yard too. The next day, we went out in the yard again, but with a different task: To identify five different smells in the yard. This #NatureMoments was simple because nature is EVERYWHERE. Bridget could have easily named more smells if she wanted to. The first smell was our fragrant lilac tree. It still has a few flowers on it that are in bloom. Beside the lilac tree was a cedar tree with its fresh, woodsy smell. 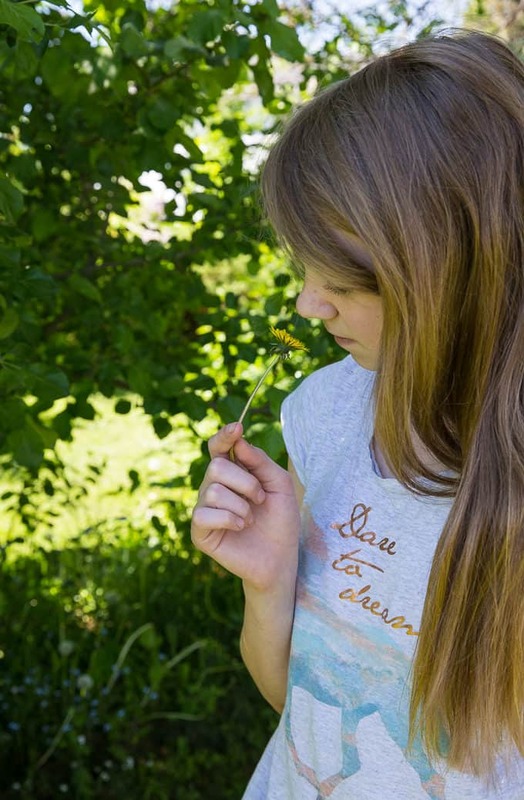 Dandelions are weeds, but are still part of nature. 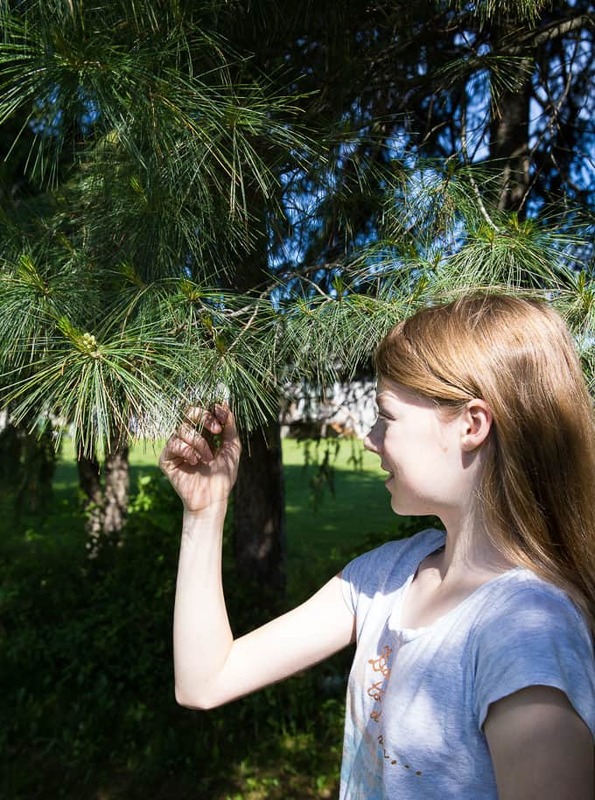 We also have a pine tree in our yard with its prickly needles. The easiest smell to find was the flowers! I love that Nature Valley has made it easy for parents to get inspired and connect with nature. As you can see from these examples, it’s not hard at all and won’t take up too much of your time. Even a small amount of time outside can make a big difference. 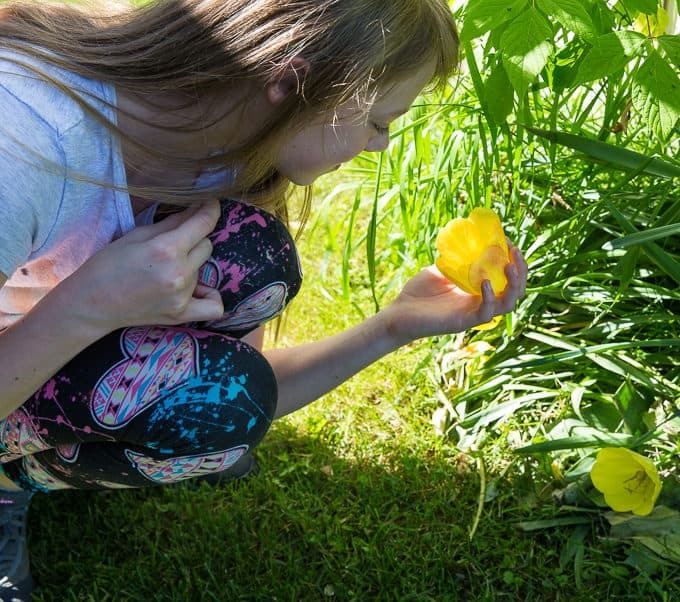 We are working on building our personal connection to nature and I hope you’ll join me and experience some of the #NatureMoments too this summer. Embrace nature this summer with your family and make memories that will last a lifetime! My mom and I both adored lilacs. 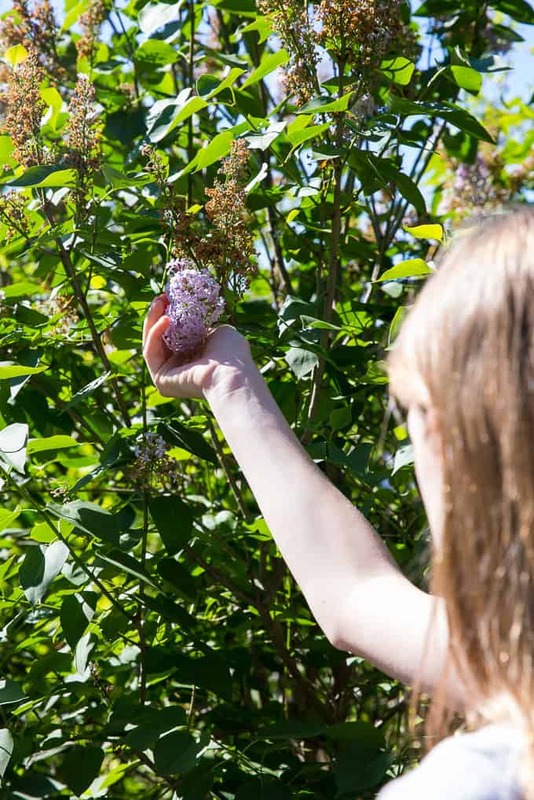 We would go for walks just to find nearby lilac bushes and take in the amazing smell! My best memories as a child are spent outdoors, exploring the neighbourhood and running wild on my bike through the nearby woods and wilderness. BTW, many of the items your girls were discovering are edible and make great teas. My girl and I love to spend time out back in the gardens, she adores her flowers! Nature is great in the summer time. just camp in our backyard.It’s fun to get out side after a long winter. Brings back memories. I spend lots of time looking for 4 leaf clovers as a child. Don’t remember if I found one. Today’s children will never understand what a nice childhood we used to have… It’s sad really. I remember going to my grandparents cabin for weeks in the summer and exploring! It was so much fun! I volunteer at the botanic gardens and love sharing my garden with others. They have a great children’s garden. I remember as a kid being outside all summer with my sister and brother and exploring nature. Kids today have lost that fun time of getting outside the house and exploring nature. I make sure to get my kids outside to explore nature in the Summer! 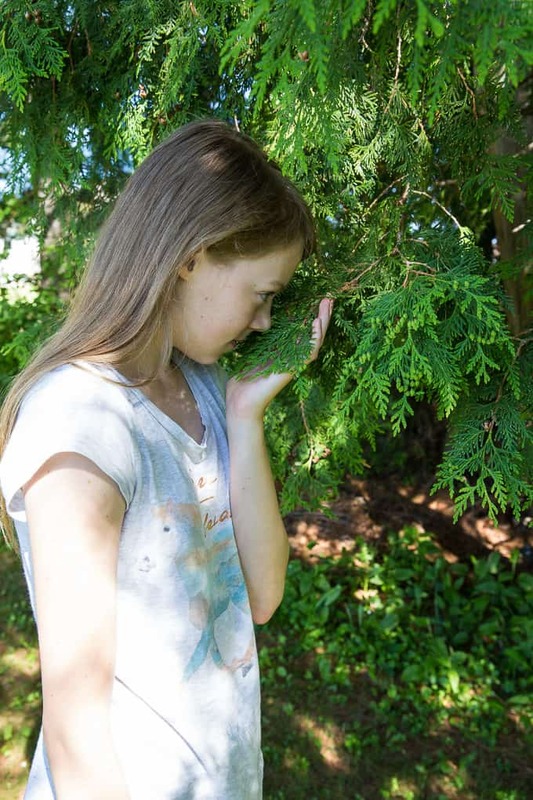 Some of my favorite memories from growing up have to do with scents. The mock orange tree under my window that I’d wake up to the smell of orange wafting in from outside, the pungent scent of lady slippers in the woods, and ferns, too, when we’d step on them on the trails. My mom’s roses, especially after it rained, we loved to stick our noses into the honeysuckle, and the scent of the blueberry patches that covered our area, where Indians once lived. I have a nature loving family and we’re currently building a garden together! Yes, great to explore everything green and fresh that is the outdoors in the summer. as we live in the city, it’s nice to have a change of scenery. Every time I go for a walk outside I notice something different about a tree or flower or a different bird. It’s always interesting.